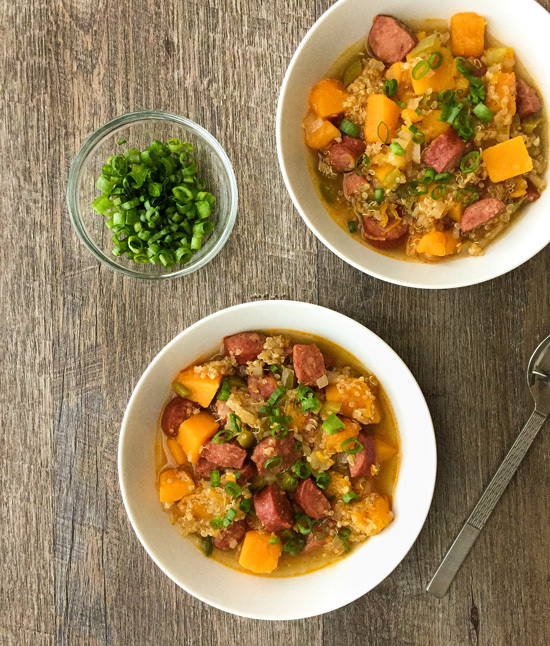 Featuring smoky, sweet and spicy flavors, this Butternut Squash Stew with Andouille and Quinoa is the perfect dish to get you through the chilly months. It is super hearty and will warm you right up! Happy Friday, y’all! I’m so excited that we’re getting back into soup season! Sad to see Summer go, but excited for Fall recipes and the upcoming holidays! Still can’t believe that Christmas is just a few months away though. It seems like it comes around sooner and sooner each year. Butternut squash is my favorite type of squash, so I like using it in all kinds of recipes. 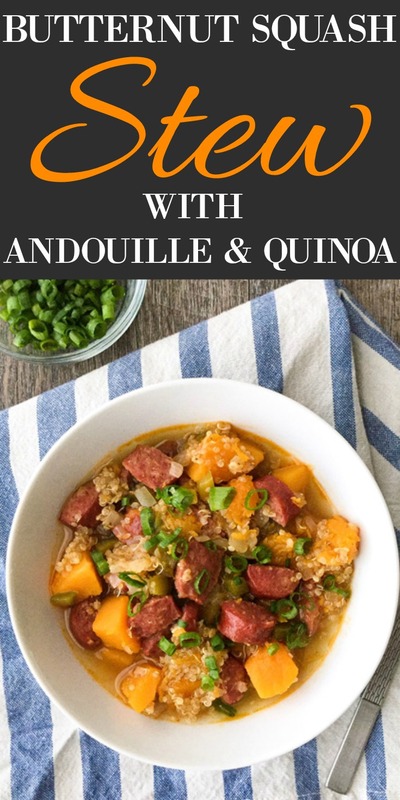 I just love its slightly sweet flavor in dishes like this Butternut Squash Stew with Andouille and Quinoa. 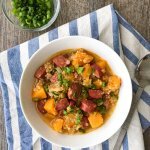 The spiciness of the andouille pairs beautifully with the sweetness of the squash. If you’re a fan of sweet and savory dishes, then I think you’ll enjoy this one! If you aren’t a fan of andouille sausage (say what?! ), then smoked sausage would probably work here as well. I just personally love the spicy kick of the andouille paired with the sweet butternut squash flavor. The Teton Waters Ranch brand is, as I’ve mentioned before, my personal favorite. The quinoa really helps to bulk this butternut squash stew up and make it incredibly hearty and filling. With the upcoming chilly months, this recipe is a great one to have in your recipe file. It will warm you right up! *This stew will thicken up as it sits, so you’ll want to add a little more stock or water if you are re-heating leftovers. Just add a little at a time until you reach your desired consistency. 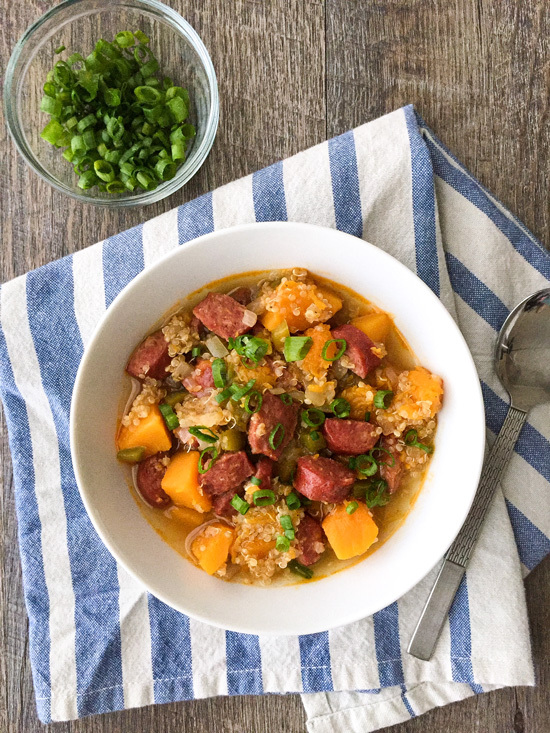 Sweet, savory and spicy flavors make up this Butternut Squash Stew with Andouille and Quinoa. It's the perfect dish to warm you up in the chilly months! In a 4-qt. dutch oven or soup pot, heat the oil over medium heat. Add the onion and bell pepper and cook, stirring occasionally, until softened, about 5 minutes. Add the andouille sausage and, let cook, stirring occasionally, for another 5 minutes. Stir in the seasonings and cook for another minute. Pour in the chicken stock or water, add the butternut squash and (rinsed) quinoa, bring to a boil, reduce heat and let simmer until butternut squash is tender and the quinoa is cooked through, about 20 minutes. Check seasonings, adjust if necessary, then serve. 1.For 4 cups of cubed butternut squash, you will need about a 2.5 lb. squash. 2.This stew will thicken up more as it sits. If you have leftovers, add a little more stock or water until you reach your desired consistency. By Tempie at March 1, 2018 .